Sustainability is a key concept for IB Economics students. It is, for that matter, a key concept for anyone, young or old, on this planet. Earth Hour yesterday was successful in at least increasing awareness about the problems we all face. But even if Earth Hour was repeated on a daily basis, the problem that we, our children and our grandchildren face will only get worse, if the developing world is neglected. And the biggest cost of the current crisis may be exactly that what needs to be done in the developing world is shelved. No matter what the advanced economies do to promote sustainability it can never succeed if the developing world is left behind. The global economic crisis will be with us for a generation, not just a year or two, because it is really a transition to sustainability. The scarcity of primary commodities and damage from climate change in recent years contributed to the destabilization of the world economy that gave rise to the current crisis. Soaring food and fuel prices and major natural disasters played an important role in undermining financial markets, household purchasing power, and even political stability. Viewed in this way, an essential policy that developed and developing countries should pursue in overcoming the crisis is to build infrastructure suitable for the twenty-first century. This includes an efficient electricity grid fed by renewable energy; fiber and wireless networks that carry telephony and broadband Internet; water, irrigation, and sewerage systems that efficiently use and recycle fresh water; urban and inter-city public transit systems; safer highways; and networks of protected natural areas that conserve biodiversity and the habitats of threatened species. These investments are needed in the short term to offset the decline in worldwide consumption spending that underlies the global recession. More importantly, they are needed in the long term, because a world crowded with 6.8 billion people (and rising) simply cannot sustain economic growth unless it adopts sustainable technologies that economize on scarce natural resources. In practice, the global crisis means that sustainable investments are being curtailed rather than expanded in the developing world. As access to international bank loans, bond flotations, and foreign direct investment is lost, infrastructure projects talked about in the past are now being shelved, threatening the political and economic stability of dozens of developing countries. The above are from his commentary The Transition to Sustainability posted in Project Syndicate. 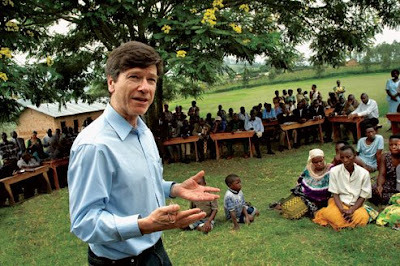 Read also this Vanity Fair article about Jeff Sachs and watch this short video on Ruhiira, a "Millennium Village, in Uganda. Costs of Privatizaion: Increased mortality?? Do you demand soft and comfortable?